Making marinara sauce is so simple, and it tastes much brighter and more fresh than what you can buy at the store. Heat olive oil in a large pot over medium-low heat. Add onions and garlic then cook, stirring occasionally, until softened but not browned – about 8 to 10 minutes. Add the grated carrots, and a pinch of salt then cook another 3 to 5 minutes, stirring occasionally until softened. While the vegetables cook, open tomato cans then pour tomatoes with juices into a large bowl. Use your hands or a potato masher to crush the tomatoes until desired sauce consistency. Add crushed tomatoes with all juices and bay leaf to pan. Stir sauce then bring to a boil. Reduce heat to a gentle simmer and cook, uncovered and occasionally stirring, for 20 to 30 minutes. Season to taste with salt and pepper. 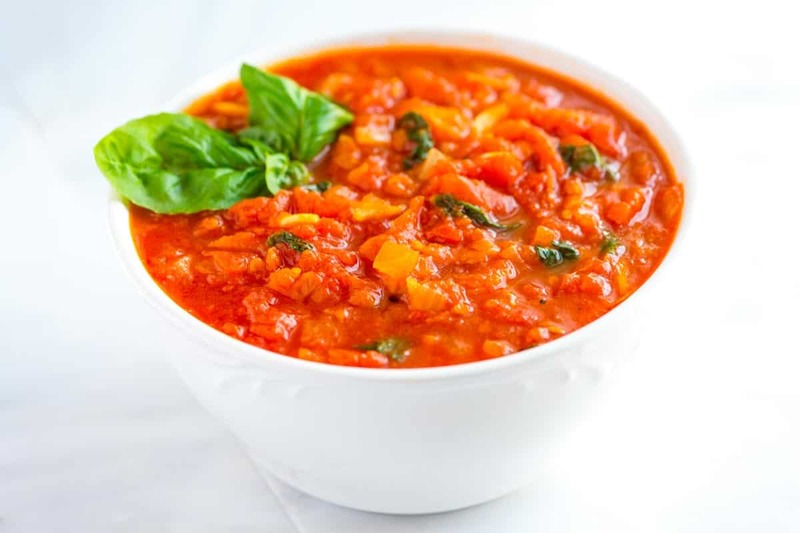 (Note – if the sauce is too bright or acidic, try adding a pinch of sugar to balance the acidity from the tomatoes). Remove bay leaf and discard then stir in chopped basil. Use straight away or refrigerate up to one week or freeze up to 6 months. Fresh tomatoes: For fresh tomatoes, we recommend peeling them first. To do this, cut an “X” in the bottom of each tomato then add to boiling water for about 1 minute. Then plunge into icy water. The peel should come off easily. You will need about 4 pounds of tomatoes to equal 2 (28-ounce) cans. Nutrition facts: The nutrition facts provided below are estimates. We have used the USDA Supertracker recipe calculator to calculate approximate values. We assumed 1/2 teaspoon of salt.